The Trent Valley 100 is one awesome way to finish your sportive season, cleverly designed routes and a great HQ give us a great atmosphere. We have brought some great events across the summer months and the Trent Valley 100 is that last ‘get together’ of them. It will also be the last ride to be eligible for our final competition, everyone that has ridden at the Roux Bikes 100 series in 2018 will be entered into the final prize draw to win a £500 voucher for a Wheel Set from our friends at Cycle Route Lincs – you’ve got to ride it to be in with a chance! The 100 Mile route was designed with two hours of rolling roads to get those legs warmed up, a quick break at the feed stop and then it’s on to 40 miles of relentless climbing, if you aren’t going up, you are going down. The final section is a roll off the Wolds and back down deep into the Trent Valley, finished with a final climb up to HQ. The 100km ride shares the same start to the feed stop as the 100 Mile route but then darts off across a heavily marshalled section of Lincoln (just 2 Miles) and then back out towards Scampton with a few short but sharp climbs thrown in, a great route and what a way to finish the season. The new short route is great finish to the season and welcoming ride to anyone who is new to cycling, join us for this and who knows what you will fancy attempting next year? A great last get together of the season with this the toughest of the 100 Series and just prove to yourself how you have improved over the season! Photos will be available to download free of charge, courtesy of Adie’s Photography, a top local cycling photographer. Online entry closes at midnight on 10th October. Please have look at a map, do not follow a sat nav blindly to the Postcode as it will bring you to the back gate of the academy, DN21 1XZ will get you to Corringham Road where the entrance is. A fantastic 100 mile route that begins with 40 miles of rolling country roads before the climbing starts. We then bring you 40 miles of Wolds climbing capturing a whole 3000ft finished off by 20 miles of rolling countryside just to cool down with at the end, if we don’t get a headwind back this year! There are two feed stations on this route. The first at Coleby, after the Alpinesque climb providing sandwiches, crisps, cake, fruit, tea or coffee and SIS top ups. The second feed station is at Binbrook, right in the middle of the Wolds section of the ride, this feed station will be stocked with cake, bananas, tea or coffee, more Haribo and SIS, so that we keep you fueled to the end! If you started your first Sportive season with us then this will be the perfect finish for 2018. The first 35 miles of the route is shared with the 100 mile route so there’s a great atmosphere as all riders stay together up to the feed station at Coleby in the rolling countryside. We provide sandwiches, crisps, fruit, cake, tea or coffee and SIS top ups. The route when it splits takes riders into Lincoln to take in the sights and hills. We manage to find 24 miles of climbs for this route before returning to Gainsborough with a total of 1600ft of climbing over the whole route. We hope you enjoy this one. 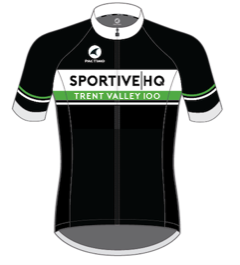 You can order a Trent Valley 100 jersey online and it will be delivered one week before the event!